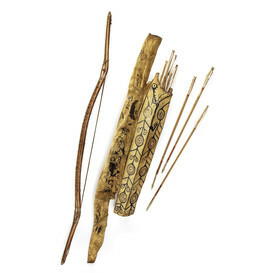 Before guns became widely available, men and some women used bows and arrows for hunting. They stalked caribou on the open tundra, shot bears, muskrats, and birds, and carried the weapon on kayaks for taking seals. This type of sinew-lashed, double-curved bow is more powerful than the plain wooden type. The set includes a bow case and quiver painted with hunting scenes and animal spirits. Deadly warfare with bows and arrows is recounted in Yup’ik oral tradition.